Say goodbye to the ordinary bowls! What is the most SPECIAL feature of these bowls? A simple and beautiful design - Most customers love this distinct pattern and we are proud of it. The unique shape makes the bowl matching any occasions. They can be perfect decorations for kitchen, dinner party or restaurant. Add more interesting to your kitchen, you will get many compliments from your friends and family because of these special bowls. 18oz is a perfect size for so many things. They are great for enjoying your food, such as cereal, cream, salad, desserts and stews. If you need a bigger bowl, don't worry! Sweese also provide the 28oz bowl set with the same shape. 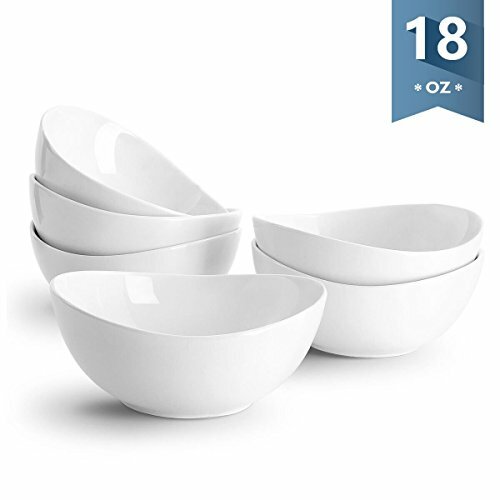 Add the Sweese 1101 Porcelain Bowls to your cart now! GOOD SIZE FOR VARIOUS FOOD - It holds 18 oz top to the rim. The little bowls are just the right size for salads, ice cream and individual desserts, or even pasta, soup, cereal. You can also use them for food prepping. They works well for a variety of uses.